If you’re looking for inspiration for a holiday dessert, look no further than the Dupont Circle Farmer’s Market. Pears and apples are currently in season, and make lovely pies, tarts, and sorbets. You can also buy local eggs and milk, which you can use for ice creams, custards, and even hot chocolate. And if you don’t want to heat up your oven, serve slices of pears with a local cheese for a sophisticated finish to your holiday meal. 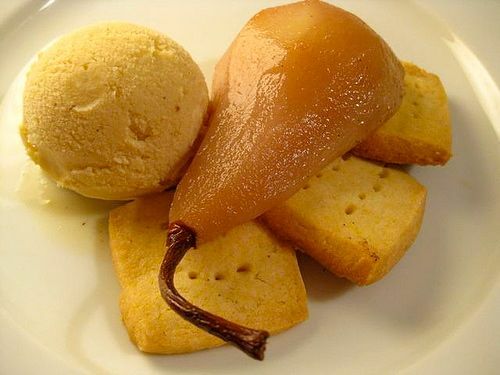 This recipe for poached pears with almond ice cream and shortbread uses ingredients from the Dupont Circle Farmer’s Market — the pears come from Toigo Orchards in Shippensburg, PA, and the milk for the ice cream comes from Clear Spring Creamery, in Clear Spring, MD. The recipe is a play on a classic French almond tart, which is made with a shortbread cookie crust, almond pastry cream, and poached pears. This interpretation is a little lighter than a classic tart, making it a nice and refreshing finish to a heavy holiday meal. Note: begin making this one day ahead – you will need to give the custard time to cool. Combine milk and half of the sugar in a large saucepan. Heat gently over moderate heat. Place the almonds on a sheet pan and toast in the oven, 5 to 6 minutes or until almonds are light brown. Remove from baking sheet and roughly chop. Immediately add almonds to the milk and sugar mixture. Heat milk mixture until it comes to a boil. Remove from heat, cover, and let steep for 30 minutes. After the mixture has steeped, reheat on low heat. In a medium bowl, whisk together remaining sugar and egg yolks until pale – about 3 minutes. Pour a little of the hot milk into the eggs, whisking constantly, to temper the yolks. Slowly whisk the yolk mixture into the milk mixture. Cook on low heat, stirring constantly, until the mixture has thickened and coats the back of a spoon – about 3-5 minutes. Strain into a medium bowl and discard almonds. Stir in amaretto. Place the bowl of ice cream custard over a large bowl of ice water to let cool. When the custard has reached room temperature cover and place in refrigerator to chill for at least 8 hours, or preferably overnight. Freeze in an ice cream maker according to the manufacturer’s instructions. Sift together flour, cornstarch and salt into a bowl, then whisk in cornmeal. In the bowl of a stand mixer fitted with a paddle attachment, rub the lemon zest into the sugar with your fingers, until the sugar is moist and smells of lemons. Add the butter and vanilla and beat on medium speed until light and fluffy – around 3 minutes. Reduce mixer speed to low and add the dry ingredients, mixing until everything is just combined. Place dough on a piece of plastic wrap and pat into a disk. Wrap in plastic wrap and refrigerate until chilled – 2 hours. Place dough on a lightly floured work surface and roll into a rectangle approximately 4 1/2 by 5 inches; dough should be 1/4 inch thick. Cut into 1 1/2 inch squares. Place squares on a baking sheet lined with parchment paper and prick with the tines of a fork, gently pushing tines through the cookie until they hit the sheet. Bake shortbread cookies for 25-30 minutes, until they are just set and light brown. Let cool. In a large pot bring the white wine, red wine, water, honey, ginger, and vanilla bean to a boil. Reduce heat to medium-low; cook 5 minutes. Meanwhile, peel pears and cut in half lengthwise. With a spoon, scoop out core and seeds. Remove fibrous fibrous strip from center with a paring knife, but leave stems intact. Gently lower pears into pot. If not completely covered by liquid, lay a piece of parchment paper directly on pears. Cook until a paring knife slides easily into pears, meeting slight resistance, 15 to 20 minutes. Remove from heat; let cool in liquid 30 minutes. Use a slotted spoon to transfer pears to a large bowl; cover with parchment paper. Place each pear on a serving plate. Add a scoop of ice cream and three cookies, arranging as you desire. Enjoy! Thanks for the yoga-clothing shout out on your twitter.